@SocialChat wait a sec. – my avatar is not done yet!!! bad planning is a challenge. No planning is even worse. But if you get into the flow all plans are forgotten and the guilt might come afterwards. As said: 4 buckets, get rid of the content of 1. [->try to avoid] 3. [->delegate] and 4. [->don’t do] and then work on the important but not urgent tasks. Then you have enough time to get the job done in high quality. ToDo lists don’t work for me b/c my tasks have different scopes, life spans and priority. But I like to check items off from a list when they are done. Celebrate success! (to a certain sense). 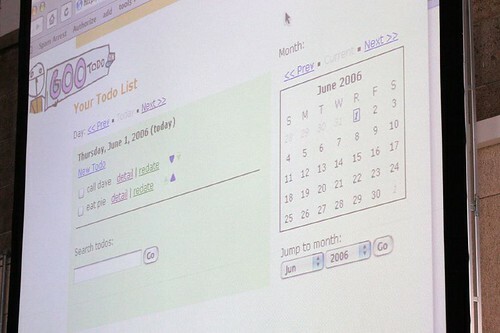 I would love to try GOOTODO – The basic idea is to send emails to yourself in the future. And one for the road: “Without the last minute, nothing would get done.” –– bye everybody. And next week in my series of SocialChats: The Next Big Thing!